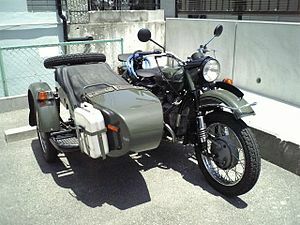 A motorcycle (an aa cawed a motorbike, bike, or cycle) is a single-track, ingine-pouered, motor vehicle. Motorcycles vary considerably depending on the task for which they ar designed, such as lang distance travel, navigatin congestit urban traffic, cruisin, sport an racin, or off-road conditions. Motorcycles ar ane o the maist affordable forms o motorised transport in mony parts o the warld an, for maist o the warld's population, they ar an aa the maist common type o motor vehicle. There ar aroond 200 million motorcycles (includin mopeds, motor scooters an ither pouered twa an three-wheelers) in uise warldwide, or aboot 33 motorcycles per 1000 fowk. This compares tae aroond 590 million caurs, or aboot 91 per 1000 fowk. Maist o the motorcycles, 58%, ar in the developin kintras o Asie—Soothren an Eastren Asie, an the Asie Pacific kintras, excludin Japan—while 33% o the caurs (195 million) ar concentratit in the Unitit States an Japan. Indie wi an estimatit 37 million motorcycles/mopeds wis hame tae the lairgest number o motorised twa wheelers in the warld. Cheenae came a close seicont wi 34 million motorcycles/mopeds. This page wis last eeditit on 8 Mairch 2013, at 22:49.